Move over sliced bread; there’s a new fare in town. Tortillas are now an indisputable staple of the American diet. 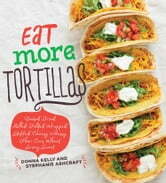 Expand your horizons beyond the humble quesadilla with the help of this funky new cookbook, Eat More Tortillas. Try Smoked Salmon Triangles, Sloppy Joe Tacos, Southwest Lasagna, Tortilla Cannolis . . . and the list goes on with 75 recipes for breakfasts, soups, salads, snacks, dinners, and desserts—each featuring the beloved tortilla. 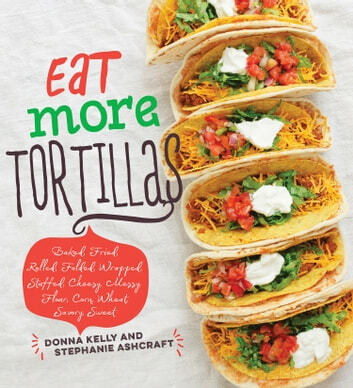 Whether you’re cooking a family meal, prepping for game day, snacking on the go, or navigating your first kitchen, this bargain cookbook will give anyone plenty of reasons to Eat More Tortillas. Donna Kelly grew up in southern Arizona. She has appeared on Martha Stewart’s Sirius radio show, Everyday Food, and writes for Apronstringsblog.com. She is the author of nine cookbooks including Quesadillas and Burritos. She lives in Utah. Stephanie Ashcraft has spent several years teaching classes on cooking as well as on saving time and money both in person and on television. Author of the first in Gibbs Smith’s best-selling “101 things” series, she has contributed to 12 additional books in the series as well as 200 Cake Mix Creations and 200 Salads. She lives in Salem, Utah with her husband and children.